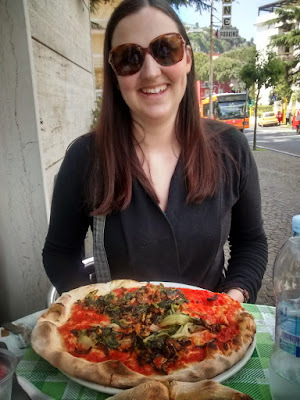 So today I will be posting about our day trip to Sorrento. 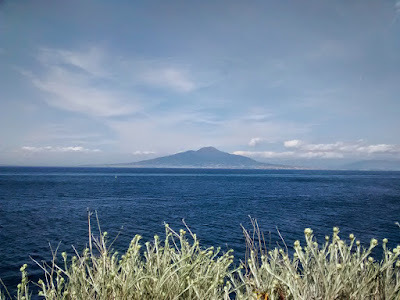 There will be a lot (like seriously a lot) of photos of the water and Vesuvius who finally decided to come out of the clouds. 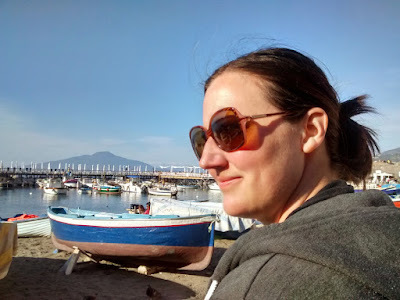 As I said in my first post on Naples, a lot of people thought you should make Sorrento your home base and day trip to Naples if you want. A lot of people seem to really like Sorrento. While it was nice, it is just a small, beach-ey resort tourist town without much of a beach. The downtown area is not very big and is just full of tourists and tourist shops. I swear the only locals in the downtown area were those who were working. The streets were packed with people (I am glad we didn't go there on the weekend!) and after maybe an hour we were out of things to do. Well that is not quite true, but in downtown we were out of things to do. I am glad we didn't stay there. It would have just been sitting by the pool all day or something which eh. Not when we could be exploring Naples! We walked up to the non-touristy part of town for lunch. There wasn't a lot up there, but the restaurants were more people who lived there. Right through the middle of town is this giant crevasse which was odd. After lunch we decided to walk out to the Roman ruins which were only about a half hour walk outside of town. It was a little crazy though as you walk along the main road, which is busy, but the sidewalk just ends a short way outside town so you walk along the road (no shoulder). The cars still honk when they are coming up behind you though so it worked...and there were others just walking along the road as well, so it wasn't just us. These next two belong to the collection "Raymond looking at things"
It was pretty hot in the sun so we stopped at a little store on the way back from the ruins to get a cold drink. We both thought it would be more expensive since it is so far out of town, but they were some of the cheapest drinks we got on our trip. When we got back into town we sat outside at one of the places in downtown and people watched. Fun times. After the beach we got some dinner then headed back to Napoli. I suppose that is good enough for this post :) Next time the Festival of San Gennaro!